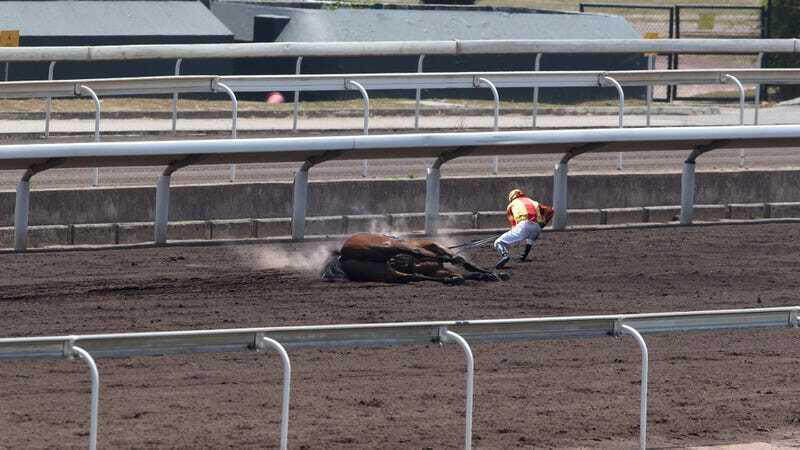 ARCADIA, CA—In an effort to honor the equestrian’s courage and steadfast commitment in the face of adversity, Santa Anita racetrack officials awarded jockey Evan Spangler Tuesday with first place for dragging his dead horse 30 yards over the finish line. “The perseverance and bravery Evan displayed as he gripped the reins of Fool’s Gold, dug in his heels, and pulled the thoroughbred’s corpse down the dirt track simply needed to be recognized,” said track director Michael Albrecht, who noted that while most jockeys would have given up after their 1,200-pound horse collapsed from a massive heart attack, Spangler didn’t hesitate to lug Fool’s Gold across the track despite a persistent cloud of flies around the carcass. “We watched disaster strike only three lengths into the contest, but Evan was able to turn tragedy into an awe-inspiring triumph. Even though it took him almost two hours and countless stumbles to finally haul Fool’s Gold to the finish, we felt his sportsmanship deserved Santa Anita Racetrack’s highest distinction. Towards the end of his remarkable race, Evan had the entire crowd on their feet, tears streaming down their faces as he trudged down the final stretch. After a few rough months at the track, this type of feel-good story is just the reminder we all needed about the magic of horse racing.” At press time, sources confirmed Spangler had already fielded offers from several Hollywood studios for the rights to adapt his inspiring tale.